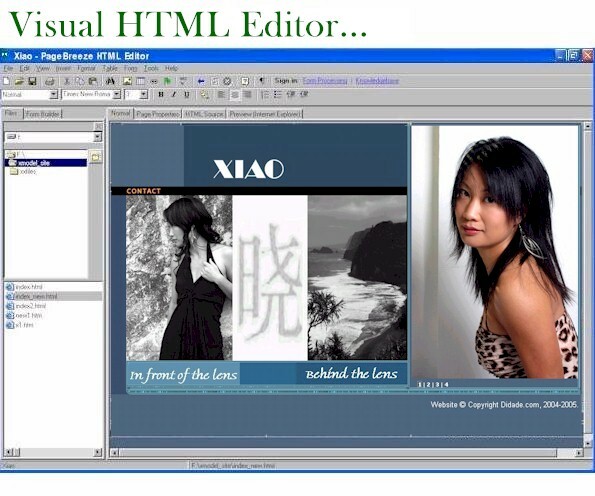 PageBreeze Free Website Builder is an award-winning HTML Editor which has both visual (WYSIWYG) and HTML tag/source modes. PageBreeze Free Website Builder's design emphasizes simplicity and ease-of-use. You'll find that you'll be creating great looking web pages almost instantly--with virtually no learning curve! PageBreeze Free Website Builder is a completely free download for personal use and will never expire. Get your free copy now (approx. 5 MB). time with a click of the mouse, and any changes you have made will instantly be reflected in both modes. Direct access to hundreds of free website templates to give you a fast start on creating a great looking site. Drag-and-drop Form Builder makes it fast and easy to create powerful web forms. Microsoft Internet Explorer 4.0 or later. PageBreeze Free Website Builder is completely free for personal, not-for-profit, or educational use. There are no limitations, no nag screens, no required registration, and the software will never expire . If you use PageBreeze in your job, or in a for-profit business for non-evaluation purposes, you must obtain an inexpensive license for PageBreeze Professional , which includes several more advanced features. You may distribute the PageBreeze Free Website Builder installation file in any way you wish, as long as you make no modifications to it. You are welcome to give PageBreeze to your customers or include it with other products (for example, a web hosting account), as long as you do not sell the software separately. Get your Free Website Builder Now! Download size is about 5MB. Help promote PageBreeze Free Website Builder! (Click the highlight button, then right click and choose Copy -- then paste into your HTML code.) Thank you! (c) PageBreeze.com 2007. All Rights Reserved.